This portrait of a young lady was painted in Florence in the 1590s. An old inscription on the reverse suggests that the sitter had previously been identified as Marie de Medici, daughter of Francesco de Medici, Grand Duke of Tuscany. Such an identification is tempting, for not only would the sitter here be at about the right age to be the young Marie in Florence before she left in 1600 to marry Henry IV of France, but the likeness in the face, as well as the colouring of the hair and eyes, is compelling. Furthermore, the crown the sitter holds here is similar to that of the Medici crown. However, the overall size and appearance of the portrait is now thought to be too restrained to show a daughter of the rulers of Florence. 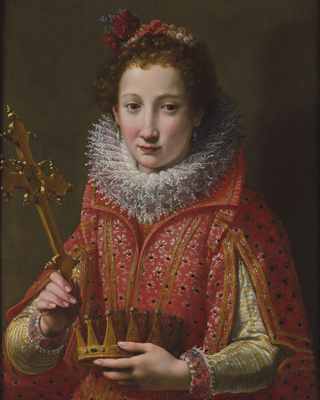 Lisa Goldenberg Stoppato has suggested that the cross and crown may be an allusion to St Helena of Constantinople, and thus a play on the sitter’s name. No early history of the picture has so far come to light. A number of scholars have now identified the portrait as being by the Florentine painter Santi di Tito, including Dr Jack Spalding, author of a number of studies on Santi. Although Santi began his career as a pupil of the celebrated Mannerist painter Agnolo Bronzino, by the 1570s he had turned his back on the elongated forms of Mannerism, and focused instead on a more easily accessible realism and purity of approach. Such a change in style came about as part of the wider artistic reaction, particularly in the Catholic Church, against the devastating success of the Reformation in Europe, and the belief that Mannerist art, with its mystical inventiveness and complex narratives, was too challenging for mass audiences. The Church’s counter-reformation required religious paintings that were relatively simple to follow, and which, through a greater realism, were able to move audiences with recognisable depictions of, say, the life of Christ, the miracles of the saints, and other basic tenets of Catholic theology. Santi became a leading proponent of this new style, which is occasionally called contra-maniera. The present portrait, therefore, not only contains all the hallmarks of Santi’s technique, but is a good demonstration of late sixteenth century Florentine counter-reformation painting. The attention to detail in the religious symbolism of the picture is particularly telling, with the ultra-realistic cross being as much the main focus of the work as the sitter’s face. The lack of a complex background and the striking colour of the pink dress also serve to create a straightforward image in which the narrative would have been obvious to a contemporary viewer. At the same time, however, elements of the portrait betray Santi’s earlier schooling, most notably the Bronzino-esque drawing of the face. Santi is best known as a painter of altarpieces and frescoes, but a number of portraits survive, many of them showing members of the Medici family. He was also an architect, although little evidence of his buildings remains. He began his career in Florence, where he was admitted to the Comagnia di S. Luca in 1554, but also practised and studied in Rome and Venice. As well as Bronzino, his masters included Baccio Bandinelli and Giorgio Vasari, who regularly employed him. His major early works include the c.1572 Resurrection in Santa Croce, Florence. By the end of the 1570s, however, he had become a proponent of the counter-reformation, and works such as the 1579 Martyrdom of St Stephen (Florence, Church of S. Gervasio & S. Protasio) demonstrate his much simpler style, as well as incorporating the clarity of technique that he applied to his portraiture. Such an approach is now recognised as a bridge between Mannerism and Baroque.